LAKEVIEW — Stephanie Lock is never without pie, and she wants the same for the rest of us. Lock, 44, of Lakeview, is embarking on her third season selling pie subscriptions through her company, Rustic Tart. That's right — a summer of pie or, more accurately, free-form tarts. A full subscription at $250 gets you a 10-inch tart every other week from June through September, eight in all. A half-subscription, should you want less pie, and Lock doesn't quite understand why you would, costs $140. "I have people who say, which just astounds me, 'Well, it's just so much pie,' and I think, 'Are you kidding me?' " Lock said. "How could it be too much pie?" The deadline to sign up is May 31. As with a CSA (community supported agriculture), or the less ubiquitous bread subscription, customers pick up their shares on certain dates. Lock has three new pickup locations this year — Bow Truss Coffee Roasters at 2934 N. Broadway and 406 N. Wells St., and Hewn, 810 Dempster St., Evanston. Subscribers aren't told in advance what type of pie they're getting. Could be nectarine one week, Italian plum another — it just depends on what's in season. Lock buys exclusively from area farmers, including Mick Klug of St. Joseph, Mich., and Tracey Vowell of Three Sisters Garden in Kankakee. She tucks about a pound and a half of fruit into each tart. Customer Monica DeBartolo, who lives in the same building as Lock, admits the pie subscription is "a luxury." Still, she has signed up for a third year. "I didn't know rhubarb, and especially blueberry [pie], could be so delicious. And you don't need ice cream. You don't desire ice cream," DeBartolo said. Lock grew up in Iowa State Fair country — Des Moines — which might explain her affinity for pie-baking. The elder Lock schooled herself in pie and went on to win ribbons. She even became a pie contest judge. Stephanie Lock remembers those years — the "crazy race" to the fair and the big, beautiful ribbons. 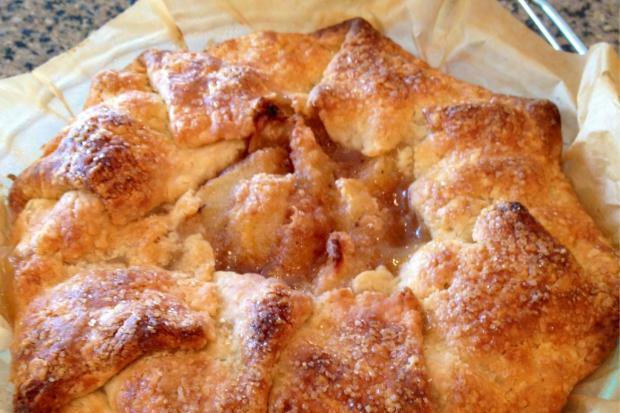 And she remembers the rustic galette her mom made for dessert at home one night. "All the bells and whistles went off," she said. "I was like, 'This is what it's all about.' The ratio of pastry to fruit was perfect." Lock honed her own pie-baking skills while raising two daughters and building a career as an interior designer. When her design business took a hit in the recession a few years back, she turned back to pie. At first, Lock sold pies to friends and parents at her daughter's Lakeview school. She made Rustic Tart official in 2011, after getting the necessary licenses and a slot in a shared-use commercial kitchen. Her home freezer is rarely without the fixings for pie. "I'll make pie at night so we can have it for breakfast in the morning," she said. Lock sells at occasional events such as Dose Market, but for the most part, her pies are available only by subscription. This year, she plans to sell ready-to-bake pastry dough for $10 a batch at pop-up sales (check her Facebook page for upcoming events). She has fiddled with various methods and combinations of fats and flours over the years. These days, she uses only butter in her crust, Plugra at that. "It's all about the pastry for me," said Lock. "Someone once said to me, 'You could wrap carpet nails in that pastry and it would be delicious.' "
"It melts in your mouth," DeBartolo said. But the ultimate compliment comes from Joyce Lock, who said her daughter bakes a better pie that she ever did. "It's true," Joyce Lock said. "She's mastered all of it."